Is there a meaning in the Bible, or is meaning rather a matter of who is reading or of how one reads? Does Christian doctrine have anything to contribute to debates about interpretation, literary theory, and post modernity? These are questions of crucial importance for contemporary biblical studies and theology alike. 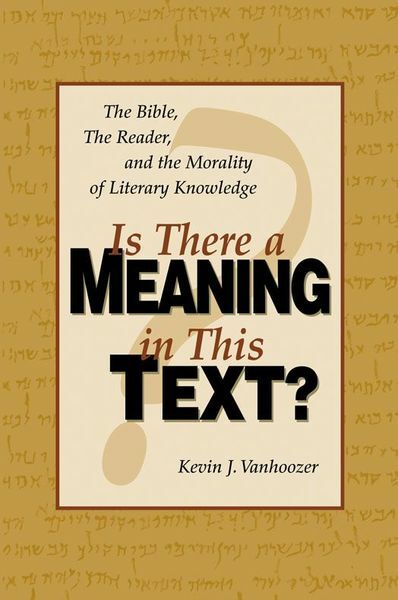 Kevin Vanhoozer contends that the postmodern crisis in hermeneutics—”incredulity towards meaning,” a deep–set skepticism concerning the possibility of correct interpretation—is fundamentally a crisis in theology provoked by an inadequate view of God and by the announcement of God’s “death.” Part 1 examines the ways in which deconstruction and radical reader–response criticism “undo” the traditional concepts of author, text, and reading. Dr. Vanhoozer engages critically with the work of Derrida, Rorty, and Fish, among others, and demonstrates the detrimental influence of the postmodern “suspicion of hermeneutics” on biblical studies. In Part 2, Dr. Vanhoozer defends the concept of the author and the possibility of literary knowledge by drawing on the resources of Christian doctrine and by viewing meaning in terms of communicative action. He argues that there is a meaning in the text, that it can be known with relative adequacy, and that readers have a responsibility to do so by cultivating “interpretive virtues.” Successive chapters build on Trinitarian theology and speech act philosophy in order to treat the metaphysics, methodology, and morals of interpretation. From a Christian perspective, meaning and interpretation are ultimately grounded in God’s own communicative action in creation, in the canon, and preeminently in Christ. Prominent features in Part 2 include a new account of the author’s intention and of the literal sense, the reclaiming of the distinction between meaning and significance in terms of Word and Spirit, and the image of the reader as a disciple–martyr, whose vocation is to witness to something other than oneself. Is There a Meaning in This Text? guides the student toward greater confidence in the authority, clarity, and relevance of Scripture, and a well–reasoned expectation to understand accurately the message of the Bible. Is There a Meaning in This Text? is a comprehensive and creative analysis of current debates over biblical hermeneutics that draws on interdisciplinary resources, all coordinated by Christian theology. It makes a significant contribution to biblical interpretation that will be of interest to readers in a number of fields. The intention of the book is to revitalize and enlarge the concept of author–oriented interpretation and to restore confidence that readers of the Bible can reach understanding. The result is a major challenge to the central assumptions of postmodern biblical scholarship and a constructive alternative proposal—an Augustinian hermeneutic—that reinvigorates the notion of biblical authority and finds a new exegetical practice that recognizes the importance of both the reader’s situation and the literal sense.